Leon Kelly, born in 1901, studied at the Pennsylvania Academy of the Fine Arts, Philadelphia. Awarded a traveling scholarship from that institution in 1924, he studied in Paris, France at the Grande Chaumiere. Other teachers included Arthur B. Carles, Jean Auguste Adolphe, Earl Horter and Alexandre Portinoff. 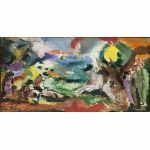 Essentially a Surrealist painter, Kelly did wide-ranging work that went from painterly to meticulous Surrealism, Cezanne-inspired watercolors, and Cubist painting. In the 1940s, Julian Levy, the Surrealist dealer, handled Kelly's work in New York City. Kelly also exhibited at the Pennsylvania Academy of the Fine Art Annuals (1933-34, 1939-46, 1966); Corcoran Gallery Biennials, Washington, D.C. (three times from 1935-47); Art Institute of Chicago, Illinois; had a 1965 retrospective exhibition at the International Gallery, Baltimore, Maryland; Long Beach, New Jersey (1968); Richard Feigen Gallery, Chicago, Illinois (1968, 1970); Newark Museum, New Jersey (1969); and the Whitney Museum of American Art, New York. Kelly's paintings are in the collections of three New York city museums, including the Metropolitan Museum of Art; Whitney Museum of American Art; and Museum of Modern Art; as well as Yale University Art Gallery, New Haven, Connecticut; Wadsworth Atheneum, Hartford, Connecticut; Pennsylvania Academy of the Fine Arts, Philadelphia; Cantor Arts Center, Stanford University, Palo Alto, California; Sara Roby Foundation Collection at the Smithsonian Institution, Washington, D.C.; Smith College Museum of Art, Northampton, Massachusetts; Sheldon Memorial Art Gallery, Lincoln, Nebraska; Newark Museum, New Jersey; and the Tel Aviv Museum, Israel. 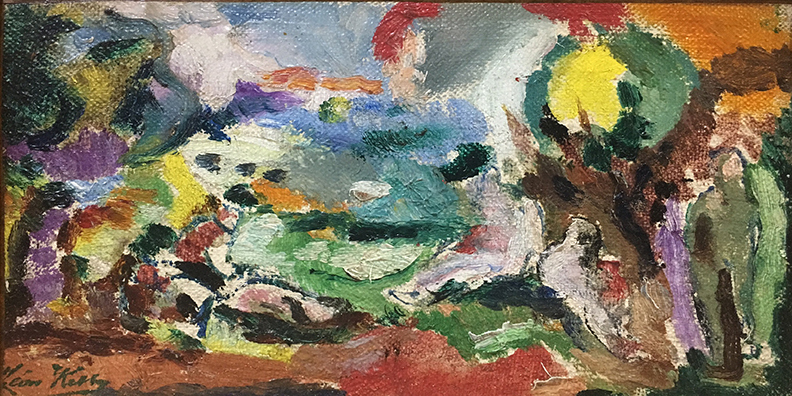 Leon Kelly died in 1982.
oil on canvas, 5.5" x 9"